If you are thinking about building yourself a new gaming PC, the most important thing that you need to understand is that you will come across a lot of PC cases, more than you might even need. The PC case market might be the most saturated one we have seen simply because case manufacturers are releasing cases faster than there is new hardware available in the market. This is certainly great because it allows the user to choose the right case for themselves, but it is also problematic for those who just want to have a good case to begin with. That is why in this list, we are going to take a look at the best cases that are designed for airflow. 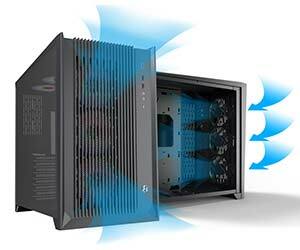 Now the cases that are designed for airflow are usually on the larger side, and have plenty of room for air to pass without any issues like turbulence. Bear in mind that although the cases that we are reviewing will be focused on airflow, you can still do some pretty great water cooled builds in these cases without any issue. To avoid any confusions, we are only going to look at the 5 best airflow pc cases available in the market. When Cooler Master released the airflow oriented H500P, everyone was excited because airflow oriented cases were making a return. However, the original case suffered from some design flaws that made the case not so ideal. Thankfully, Cooler Master already planned the H500M, and they figured out what they had to change to make the case even better. The H500M from Cooler Master is great when it comes to thermals as well as acoustic performance, the build quality is solid, and it comes with an RGB controller for the fans. The case has some pretty sweet lighting features as well and they do not require a supported motherboard either. Users also get access to updated I/O which involves a USB 3.1 Type C Gen2 front panel header, and dual 200mm intake fans for the best airflow. As far as the downsides are concerned, during my testing, I did not run into any major issues that could have broken the build experience. Everything about the H500M was on point. Overall, the case is great and there is no denying that. The shape is among the best I have seen, and when compared to the original H500P this case is based on, the H500M is a much, much better upgrade that you can buy in the market right now. Great for airflow oriented or liquid cooled builds. Simple and easy to build in. Comes with two 200mm ARGB fans. Loaded front panel header with four front panel USB 3.0 ports, and one USB Type C 3.1 Gen2 port. For the longest time, ThermalTake has been trying very hard to make a name for itself in the PC industry. They have released some really great products as well as some really mediocre ones. As far as their cases are concerned, this is the part where the fan base is divided; some laude them for being among the best while others criticize them for lacking innovation. Today, we review the ThermalTake View 71; ThermalTake’s View series has been one of the most revered series for pushing boundaries, and making up for some amazing builds. The View 71 is a full tower that is mainly aimed towards liquid cooled builds, but during my testing, I figured that the case was amazing for air cooled builds. The thermal performance of this case is one of the best, you have 8 standard PCI-E slots, and you get two more for vertical GPU mounting. You can use triple fan radiators on the front, as well as the top, and the dust filter placement on all sides is among the best I have seen. 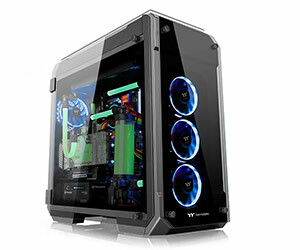 ThermalTake View 71 is covered in glass with the front, top, and both sides having thick glass panels; the side panels are swivel mounted, and can be removed for easier access or just cleaning. You even get two 140mm ThermalTake Riing fans in blue. Aside from all the great things aside, you would be wondering if there are any downsides to the case, and honestly, the only issue I have is the weight. The case weighs 42 pounds (19.05 kilos) without any hardware installed in it. That is fairly heavy, but do know that all the weight is because of the thick tempered glass panels. Spacious for both liquid and air cooled builds. Be Quiet! Is one of the best companies you should look at whenever you are in the market looking for a good case. They have some great power supply, cooler, and fan offerings as well. 2 years ago, the company came up with the flagship case called the Be Quiet! Dark Base 900 Pro, the case was ahead of its time and had features such as Qi Charging, and a great build quality. Be Quiet! has finally refreshed the case and now we have the Be Quiet! Dark Base 900 Pro Rev2. This time, you get some additional benefits such as a power supply shroud that was missing from the original case. Rest of the case remains largely the same, which should not be an issue as you are still getting a great value. 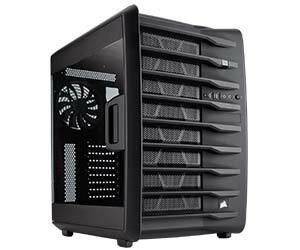 The case has one of the finest build qualities, it comes with modularity aspect and you can use your case however, you want, it has great air cooling, and water cooling support. The design language largely remains unchanged, but that is not a bad thing. The only downside would be the price premium that you will be paying, but if you are okay with that, then the Be Quiet! Dark Base 900 Pro Rev2 is a great case that you should go for. Comes with noise dampening foam. Great for water cooling, or liquid cooling. Corsair is known for some pretty amazing cases over the past couple of years. The thing that I love about Corsair is that they are not only good with playing safe, but they always release products that cater to every user in one way or another. Today, we are looking at the Corsair Carbide Air 740, the elder brother of the Air 540. 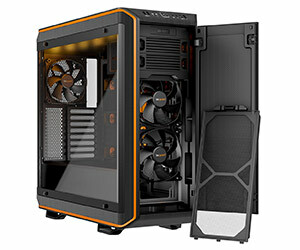 As the name suggests, this case is for people who want the maximum airflow and a clean building experience. The great thing about this case is that even with its stock configuration, the cooling is among the best I have seen. The build quality is exceptional to say the least, and no matter. The case is also roomy enough for every motherboard or type of build that you may want to build inside this computer. Overall, there are some great things about the Corsair Carbide Air 740. However, there are some downsides that I would like to mention. For starters, the case is on the noisier side, there is no bottom air filter, and the right side panel is not as solid as rest of the case. Overall, the Corsair Carbide Air 740 is among the best cases available in the market, it is only held back by a few issues that do not degrade the overall value of the vase in any severe way. If you are looking for a good airflow oriented case, this is the one that you should go for. Plenty of room for all sorts experimentation. The case can be a bit noisy. The last case on the list is something different. For the longest time Lian Li has been one of the best brands out in the market. They have released some pretty amazing cases, and there is no denying that they continue to do so. Today, we are looking at the Lian Li PC-O11 Air. For those who do not know, this is the airflow oriented version of the Lian Li PC-O11 Dynamic. 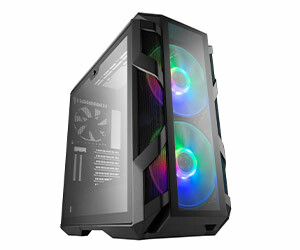 As the name suggests, this case is based for people who are looking for the best possible airflow in a good PC case. Now in terms of sheer features, the case is full of them, you get a great cooling solution whether you are looking at air cooling, or liquid cooling. Additionally, you have a lot of space for radiators, and fans as well. You can even use dual power supplies thanks to its chambered design. The case is made out of solid materials through and through and as far as the build quality is concerned, there is nothing wrong with this case. In short, you get all the amazing features that you would come to expect from a good, airflow oriented case in the market. In terms of downsides, it is nearly impossible for me to find something that I did not like. As someone who has used both the Lian Li PC-O11 Dynamic and the Air version, I can certainly say that I commend Lian Li for creating such an amazing lineup of cases that cater to gamers regardless of the features they are looking for. Building in the case is a treat. Suitable for lazy builders thanks to the dual chamber design. After testing some great airflow centered cases, I will only say that the process was not an easy one. There were so many great features available in the case, and the thing that you need to understand here is that you will find some great features on these cases. Airflow oriented cases are still very relevant because some people just don’t want to go for cases that are for liquid cooling. The list contains some of the best cases that you can buy in the market right now. If you ask me for my suggestion it would be with the Cooler Master H500M, or the Lian Li PC-O11 Air. Simply because both cases are exceptional for airflow oriented users, and even if airflow is not your ultimate goal, you are still getting cases that are an absolute joy to build in. Nearly everything about these cases is brilliant. If you like the chambered design then the Lian Li PC-O11 Air is the one that you should go for. However, if you want a standard design, then the Cooler Master H500M is the one that you should go for.